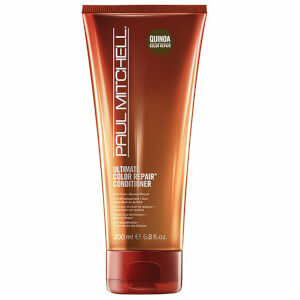 Transform lack-lustre locks with the Ultimate Color Repair™ Conditioner from Paul Mitchell. Specially formulated with the Quinoa Color Repair complex, which penetrates deep into hair to create a protective barrier and preserve colour-treated hair, leaving it vibrant and healthy-looking. An effective blend of shea butter, jojoba and soybean oil soften hair and enhance shine, whilst nourishing vitamins lock in moisture. The lightweight conditioner contains powerful antioxidants to shield hair from exposure to harmful UV rays, environmental aggressors and fading of colour. E.N. Work through clean, damp hair. Rinse.